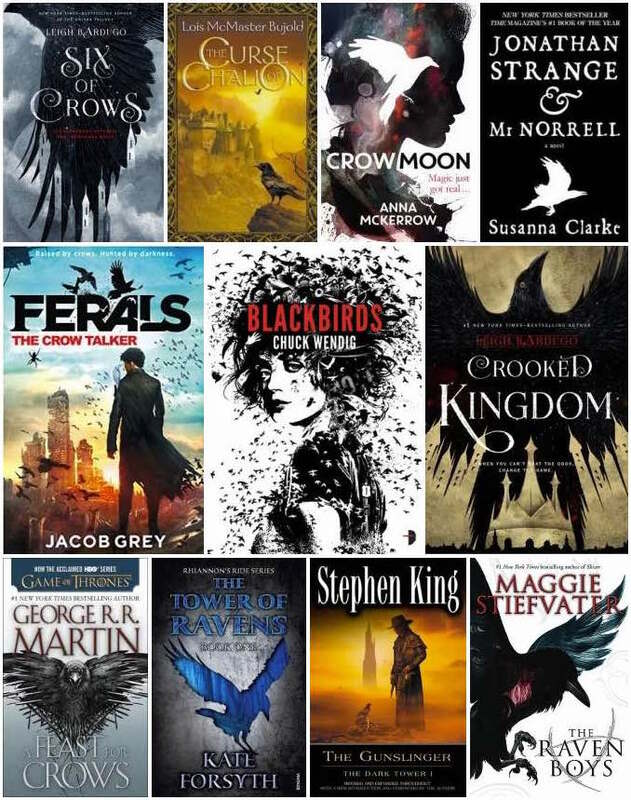 Since I love crows, and recently changed the look of my blog to feature a crow rather prominently, I thought this might be a good excuse to take a closer look at these sometimes under-appreciated birds and their prevalence in speculative fiction. Crows, Ravens, Blackbirds… What’s the Difference? Firstly, let’s get this little confusion out of the way. Crows and ravens both belong to the genus Corvus, along with jackdaws and rooks, and all of these birds are often referred to as corvids. They can be hard to tell apart, especially as many different subspecies around the world have been given the name ‘crow’ or ‘raven’. In general, however, ravens tend to be larger, and they differ in other subtle ways with regard to shape, throat feathers, call and behaviour (e.g. this site shows some differences between American crows and ravens). When it comes to fantasy, however, little distinction is made between the two, and I have a feeling it simply comes down to whatever sounds better to the author. For example, the ‘Three-Eyed Crow’ in the Song of Ice and Fire book series became a ‘Three-Eyed Raven’ in the Game of Thrones TV adaptation. It’s also common to encounter blackbirds in fantasy. A blackbird is a type of thrush, smaller and quite different in appearance to crows and ravens. However, the term ‘black bird’ is sometimes used to refer generally to a crow, raven or bird with black plumage. So, Why Are Crows and Ravens so Beloved in Fantasy? The characteristics of crows have influenced their perception by humans and role in stories and mythologies. As carrion birds with black plumage, they are often associated with death, darkness, and bad omens. Undoubtedly their tendency to land on windowsills and buildings, and to flock around human habitations and battlefields has also contributed to their importance in the stories and beliefs of humans. Norse: the two ravens Huginn and Muninn fly around gathering information for the god Odin, acting as his messengers. Odin is sometimes called the raven god, and ravens often feature on old Norse banners, armour and jewellery. Swedish: ravens are said to be the ghosts of murdered people. Irish: Morrígan, who is associated with fate, death, battle and the foretelling of doom, often appears in the form of a raven. Welsh: the king Brân the Blessed (which translates as ‘the blessed crow’) is associated with crows, death and resurrection, and his head is said to be buried under the current location of the Tower of London as a ward against invasion. This may be the origin of the belief that England will not fall to a foreign invader as long as there are ravens in the Tower of London – the reason why ravens are still kept there today. Hindu: crows appear regularly in Hindu literature and faith, often bringing information, appearing as omens, or acting as vessels used by the souls of the recently deceased or the ancestors. Australian Aboriginal – the crow is a trickster and an ancestral being. Chinese, Japanese and Korean – the three-legged crow is a figure in East-Asian mythology, associated with the sun or with divine intervention. Crows are also famous for their unfavourable collective nouns in English, namely a Murder of Crows and an Unkindness or Conspiracy of Ravens, which date back several centuries. Ravens and crows have appeared in multiple tales, nursery rhymes and works of literature. The most memorable is perhaps Edgar Allan Poe’s poem The Raven, with its iconic refrain “Quoth the Raven ‘Nevermore. '” firmly associating the raven with death, bad omens, and, to some degree, the mystery and horror genres. Charles Dickens owned a pet raven, which was believed to have inspired Poe’s poem, as well as the raven named Grip in Dickens’s novel Barnaby Rudge who was smarter than his human owner. Shakespeare often used ravens to create a sense of foreboding or impending murder, and Ted Hughes wrote a poetry collection titled Crow: From the Life and Songs of the Crow. Crows appear in some of Aesop’s Fables, exhibiting cleverness and vanity. In The Metamorphoses by Roman poet Ovid, a crow once again plays the role of the spy, exposing a lover’s tryst with a mortal and enraging Apollo so much that the god turns the crow’s feathers from white to black. The Three-Eyed Raven from A Game of Thrones is a particularly prominent fantasy corvid. It appears to be many things: the name for the soothsayer-like role and power taken over by Bran Stark, a real vessel for him to see through, and a symbol of his abilities. (Notice Bran’s name is the same as that of the Welsh King Bran the Blessed, whose name means crow in Welsh? Hardly a coincidence!) Ravens are also used to carry messages and feature in other ways in A Game of Thrones. It was perhaps The Lord of the Rings that set the precedent for crows being spies or vehicles to see through in fantasy, likely influenced by Odin’s crows. Crow-like black birds called Crebain were used by Saruman as spies, and the fellowship had to hide when the black swarms flew overhead. Even if not directly shown to be evil spies, the appearance of crows often precedes the coming of evil, and they are shown to linger around dark towers and haunted ruins, such as in Kate Forsyth’s The Tower of Ravens. Sometimes no actual crow appears in the story, but is simply used as the symbol for a character or group in the novel, such as in Leigh Bardugo’s Six of Crows, where Kaz Brekker uses a cane with a crow’s-head-shaped handle, and works for a gang that uses a crow as its symbol and runs the Crow Club. In Crooked Kingdom he reveals that he sees the bird as symbolic of himself and his past. Ultimately, crows and ravens can be found in many different tales and works of fiction, not only fantasy. They have fascinated storytellers of all kinds for centuries. However, the genre does have a particular penchant for and fascination with them. Personally, I like crows not only because they remind me of fantasy books or ancient tales, but because I find them fascinating. Every time I see one outside my window, or perched on a tree, or scratching in a field, I find myself stopping to watch. I love how sleek and black they are, the way they walk and fly, their intelligence, and the rich symbolism associated with them. I like how they appear to abound in winter, when other birds and wildlife seems scarce. I even like their morose cries (though I should note, where I grew up in Australia it was the currawongs I was usually admiring, not crows). So I guess you could say I have a soft spot for the creatures. Do you like crows and ravens, or have a favourite fictional crow? Let me know in the comments. Love this I find crows around me give me comfort. I am going to share this on my Facebook crow/earthling page. Thank you and Caw-Caw Caw-Caw. Thanks so much for sharing it, I checked out some of the videos and pictures on your page and they’ve made me love and respect crows even more than I already did! Such fascinating creatures. You are very welcome and thank you for gracing “our” (corvid lovers) page. This is an amazing summary of the symbolism of ravens and crows in literature. Anyone who has read my story “Frithigorn’s Birds” in New Realm knows that ravens play an important role in my Valley of Magic story world. They play an even more important role in the book I am currently revising, and will certainly appear on the cover prominently. As this was my first big project since getting serious about writing, I even adorned my very avisual blog with a raven perched at the top. I think the cultural ideas and mythology of ravens is an important reason why they keep being used, particularly in fantasy. For me, though, it is their intelligence that strikes my interest. If you watch all those research videos of ravens completing elaborate puzzles, you cannot help but get a feeling of something almost supernatural driving a creature with what we assume to be such a tiny brain. Ravens know you, they recognize and remember you. It’s eerie. So that’s why I love them and will continue to use them in my writing. Great post! I love crows and ravens; they are fascinating to me! One day I hope to be able to see the ravens at the Tower. There are a lot of crows where I live, and I heard a long time ago that the “lead crow” should be addressed. This way they won’t attack the lawn. So I always try to say “good morning” to the crows in the morning as I leave for work. I have no idea how to know which crow is the leader however. But I could watch them for hours. The crows try to break into walnuts where I live, so they fly up in the sky and drop the walnuts on the ground, and they place the walnuts under car tires so the walnuts open up when the car drives. They are so smart! I loved how you brought in Bran the Blessed – there are definite parallels to GOT and Bran and the crypts of Winterfell there! Fascinating stuff! Have you read the book Mind of the Raven by Bernd Heinrich? I’ve never read it, but have heard good things about it. It’s been on my TBR for ages and sounds like an interesting read! Thanks! I’d love to see the ravens at the Tower too – I didn’t realise till writing this post that there is a Ravenmaster who looks after them (coolest job ever!) and he has a Facebook page where he posts pics and videos. Made me want to see the ravens in real life. I think I also once saw a crow doing that trick with dropping a nut (suddenly nuts were falling from the air even though there were no trees around, and then I saw a crow going after them). I’ve never seen them using cars though, that’s super clever! I haven’t read Mind of the Raven but I just looked it up and it sounds fascinating, and also appears to be a much loved and well-awarded book! I’d be curious to read it too. Oh wow – I didn’t know the ravenmaster had a Facebook page. I’ll have to check that out! I love crows, although I do find them spooky sometimes – the power of so much social conditioning I suppose! Much like the way we’re afraid of cockroaches but not lady beetles. It’s as if it’s a cumulative cultural learned behaviour. Have you seen this doco about the crow’s ability to problem solve? It’s pretty impressive! Oh wow that’s such a great video!! I hadn’t seen it before. In fact if you don’t mind I think I’ll add that link into the post (with a mention that it was added from a comment) because it’s a really great demonstration of how intelligent they are. And yes, they can be a tad spooky sometimes, probably social conditioning at work there – not to mention those sharp, long beaks! Oh yes I love magpies too! When I was a kid we had one who used to hang around our backyard and taunt/harass our dog (our dog was trying to be a ferocious bird-catcher but the magpie kept taunting/swooping her until she became wary of it) and it also imitated various sounds it heard, including dog barking and horse whinnying. I wonder why we don’t see more magpies in fantasy books? Perhaps not enough grim symbolism associated with them! Believe it or not I actually forgot about the ravens in the Hobbit, so thanks for reminding me! They are great, and I think even more prominent than the ones in LOTR? haha that’s hilarious!! I don’t actually know- yes probably- they’re quite a bit more funny and less dark I suppose! Yes, for sure. haha I’m always due a reread of the Hobbit 😉 hahaha just a bit!! This was a fun read. Thanks for sharing. Raven is also an important spirit in Native American lore of various tribes. In some legends he is a playful trickster who gets into trouble, much like the equally mischievous Coyote. In other legends he helps humans by placing the sun, moon and stars in the sky. A good friend of mine, who is of the local tribe, said that she often noticed crows turning up whenever we worked outside. She always felt it was a spirit guide for her. Thanks! That’s really interesting, I can definitely understand why crows would be tricksters in some legends (which reminds me, I’ve read that pulling the tails of other animals is a favourite corvid activity! ), and helpers or creators in others. A crow would be a great spirit guide to have. Which of course, we would be remiss to not mention, for not only does it feature crow as a title, but the subject is about the mythology of crows and their connection to life and death. This is feast for corvid connoisseurs! It’s stirred my memory of the crows that haunted the fellowship as they passed over Cruel Caradras in the driving snow. Last read LOTR and the Hobbit (in which the old raven acted as a messenger for the dwarves on the Lonely Mountain) a long time ago. Glad you enjoyed it! And I’d forgotten about the old raven in The Hobbit acting as messenger – it’s been a long time since I read it too! Love this text about the black birds and will share. Great research!